I need to start by saying how much I love great musicians. 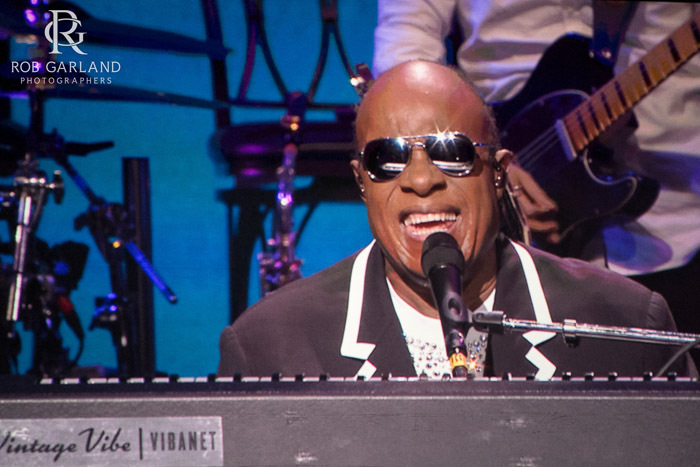 If you don’t put Stevie Wonder on your list of all time greats you are making a mistake. In an age where performers go in many different directions, this artist tours with great accompaniment. He is a musicians musician….period. He traveled with a full band complete with a fabulous horn section of almost ten people and an orchestra. Absolutely, stunning! Though most of us were there to see the great hits like “Sir Duke,” “Superstition,” “I Wish,” “You are the Sunshine of My Life,” etc., we were excited to hear great covers like “The Letter” and “People Get Ready.” Both of these songs are great cover choices. In Charlotte, he performed “Imagine” by John Lennon – but I do believe Charlottesville received the best encore – a string of hits taking the show until 12:15 and keeping most concertgoers out until 1:00am by the time they returned home. We all paid for it in dollars as well as a lack of sleep following us the next morning, but this is a “bucket list” artist. He is someone everyone that has a passion for music should see live. 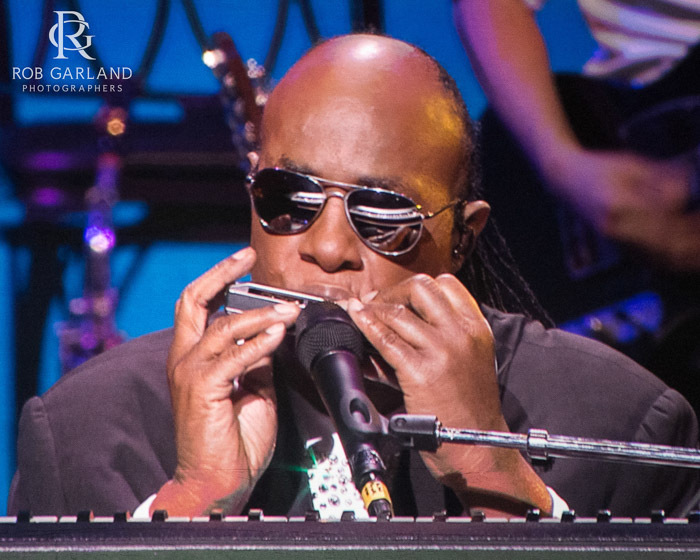 In 2012, Stevie Wonder was introduced to the Harpejji at the NAMM show and he brought it out in Charlottesville, using it during “People Get Ready.” I must say, that instrument is really cool. I was impressed. 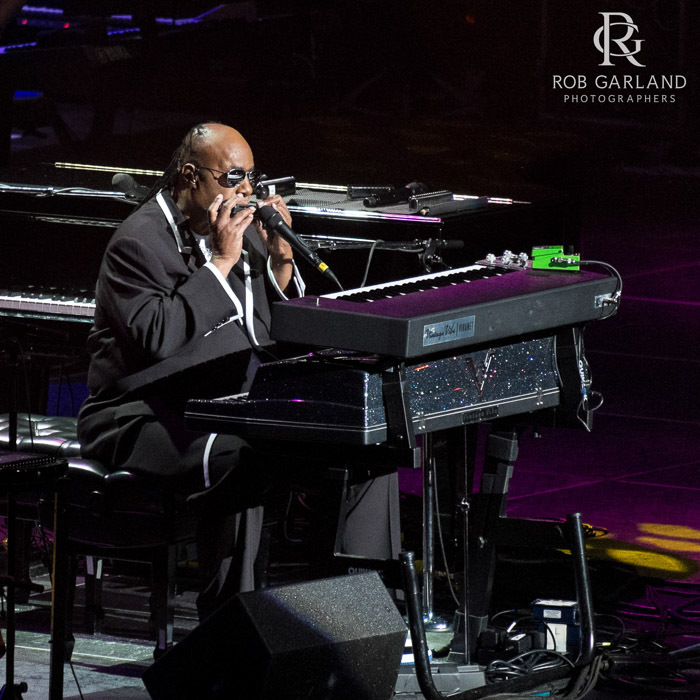 He also played the Clavinova, the grand piano, and something that resembled a Rhodes keyboard (a la Ray Charles). ….and don’t forget someone that took us to church with a Hammond Organ sound that every soul artist needs to complete the band. 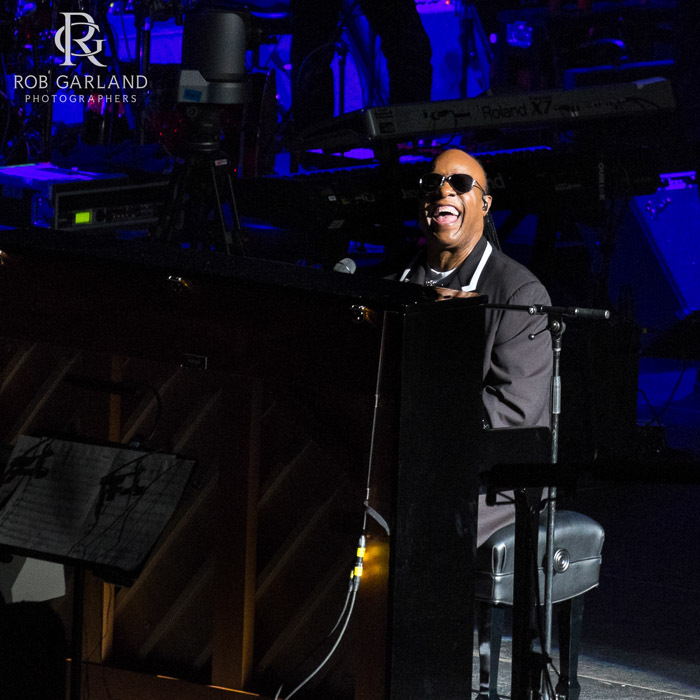 If you are a true fan, you may recall the “twelve year old genius” in the early 1960s with his hit “Fingertips” – honestly, I would have loved to see him jump into this song, even for thirty seconds, but it didn’t happen on this Charlottesville tour stop. It it certainly wonderful to see an artist with thirty top ten hits and twenty five Grammy awards, all deserved. This is the most ever awarded to a male solo artist. He also has over one hundred million records sold. Stevie is noted for being a political activist – something I wish artists would minimize at shows, regardless of their views. I am all for being patriotic (and he was…..a harmonica rendition of “The Star Spangled Banner” is certainly appealing to any patriot. A moment of silence for the families in Paris is certainly relevant and appreciated. 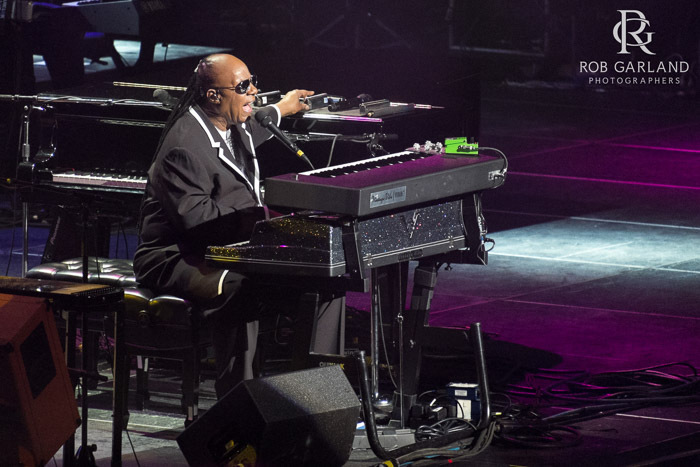 The name, “Little Stevie Wonder” was given to him by producer Clarence Paul, a member of Berry Gordy’s Motown label. 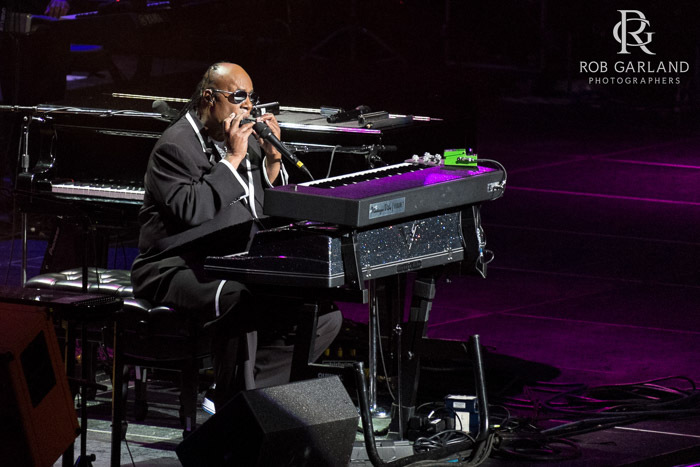 If you have a chance, pay attention to Stevie’s first album “A Tribute to Uncle Ray” – mostly Ray Charles covers. “The Jazz Soul of Little Stevie” soon followed. In 1962 he joined the “Motortown Review” and toured in theatres across America. “Fingertips” came from a recording at The Regal Theater in Chicago. It’s 20 minutes long and was an instant success. My dad personally owned the original version of this album. I remember playing it a lot as a kid. Many people don’t know this but Stevie Wonder wrote and composed “Tears of a Clown” for Smokey Robinson and the Miracles. Stevie also sang “Amazing Grace” at the funeral for one of my favorite artists of all time, Stevie Ray Vaughan. I hope you enjoy the photographs from the show. Rob Garland is the owner of Rob Garland Photographers, a company which specializes in wedding photojournalism and fine art printing. Rob prides himself on a classic, intuitive, heartfelt documentation with the utmost in visual integrity. He has documented many destination weddings throughout the U.S. and abroad as well as Charlottesville weddings at many of our outstanding local venues. Rob loves imagery that fails to go in and out of style and personal touches that make each wedding unique.